According to Phoenix, AZ’s ABC Channel 15, drug addicts in the Phoenix area have been reporting to hospitals showing the cheap drug’s characteristic rotting wounds, which fester from the inside out. Krokodil originated in Russia’s remote Siberia region, where heroin addicts who found it difficult to obtain a regular supply of real heroin synthesized the drug out of codeine-laced headache pills, iodine, red phosphorus and paint thinner. “In the 12 years that I’ve been doing substance abuse and prevention education, it’s probably the most destructive drug I’ve ever seen,” said counselor Shelly Mowrey to Channel 15. Users typically die within one to seven years of becoming addicted, she warned, saying that the drug’s appearance in the U.S. is not something to be taken lightly. 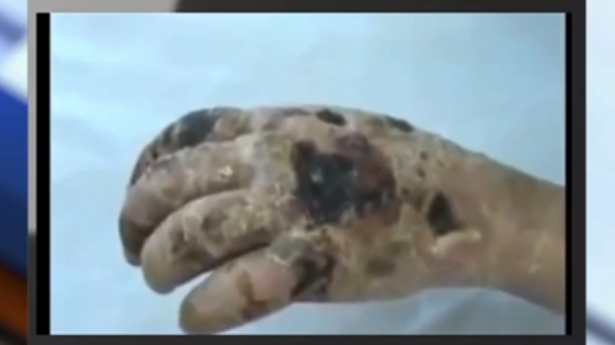 Dr. Frank LoVecchio of the Banner, AZ Poison Control Center told Phoenix’s CBS Channel 5 that the petroleum-based chemicals used as solvent for krokodil are to blame for its toxicity. “They extract [the drug] and even though they believe that most of the oil and gasoline is gone, there is still remnants of it. You can imagine just injecting a little bit of it into your veins can cause a lot of damage,” said LoVecchio.